Subject: Amendment of the Trade Unions Act, 1927 to provide provisions for recognition of Trade Unions. As you are aware that the Trade Unions Act, 1926 does not provide for recognition of trade unions or federation of trade unions by the appropriate Government. Presently, the Office of Chief Labour Commissioner(Central) performs a verification procedure and consequently Ministry of Labour and Employment has recognized 13 Central Trade Unions/Federations of Trade Unions after a verification process. The verification is done on the basis of executive guidelines. Besides, a Code of Discipline provides for criteria and procedure for recognition of trade unions operating in the particular establishment/industry. 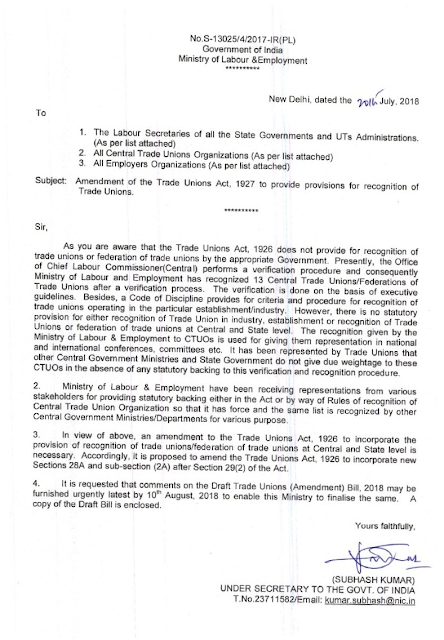 However, there is no statutory provision for either recognition of Trade Union in industry, establishment or recognition of Trade Unions or federation of trade unions at Central and State level The recognition given by the Ministry of Labour & Employment to CTUOs is used for giving them representation in national and international conferences, committees etc. It has been represented by Trade Unions that other Central Government Ministries and State Government do not give due weightage to these CTUOs in the absence of any statutory backing to this verification and recognition procedure. 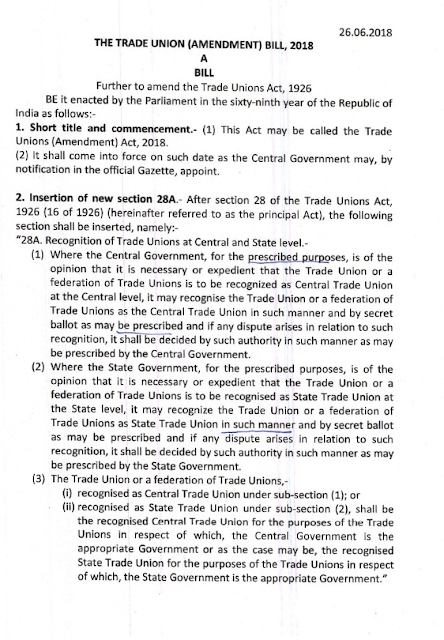 In view of above, an amendment to the Trade Unions Act, 1926 to incorporate the provision of recognition of trade unions/federation of trade unions at Central and State level is Accordingly, it is proposed to amend the Trade Unions Act, 1926 to incorporate new Sections 28A and sub-section (2A) after Section 29(2) of the Act. It is requested that comments on the Draft Trade Unions (Amendment) Bill. 2018 may be furnished urgently latest by 10′” August, 2018 to enable this Ministry to finalise the same. A copy of the Draft Bill is enclosed. Short title and commencement.- (1) This Act may be called the Trade Unions (Amendment) Act, 2018. Where the Central Government, for the prescribed purposes, is of the opinion that it is necessary or expedient that the Trade Union or a federation of Trade Unions is to be recognized as Central Trade Union at the Central level, it may recognize the Trade Union or a federation of Trade Unions as the Central Trade Union in such manner and by secret ballot as may be prescribed and if any dispute arises in relation to such recognition, it shall be decided by such authority in such manner as may be prescribed by the Central Government. Where the State Government, for the prescribed purposes, is of the opinion that it is necessary or expedient that the Trade Union or a federation of Trade Unions is to be recognized as State Trade Union at the State level, it may recognize the Trade Union or a federation of Trade Unions as State Trade Union in such manner and by secret ballot as may be prescribed and if any dispute arises in relation to such recognition, it shall be decided by such authority in such manner as may be prescribed by the State Government. the provision of recognition of trade unions/federation of trade unions at Central and State level, incorporate new Sections 28A and sub-section (2A) after Section 29(2) of the Act.